You will kick off your excursion by taking a quick stroll through the city of Messina. You will then take the Eastern motorway, a scenic route that unravels throughout the slopes of the mountain and across orchards, vineyards and woods and eventually leads past the town of Giarre and the districts of Santa Venerina and Zafferana. You will be guided throughout the remnants of ancient and recent volcanic eruptions, and you will see the streams of solidified lava cascading from the top of the mountain. You will then reach Mount Etna and the Silvestri Craters, at about 6,400 feet above sea level. Mount Etna is the highest active volcano in Europe (its ski runs stretch up the mountain to over 10,811 feet above sea level), and from here you will have a unique bird’s eye view over the Gulf of Catania. 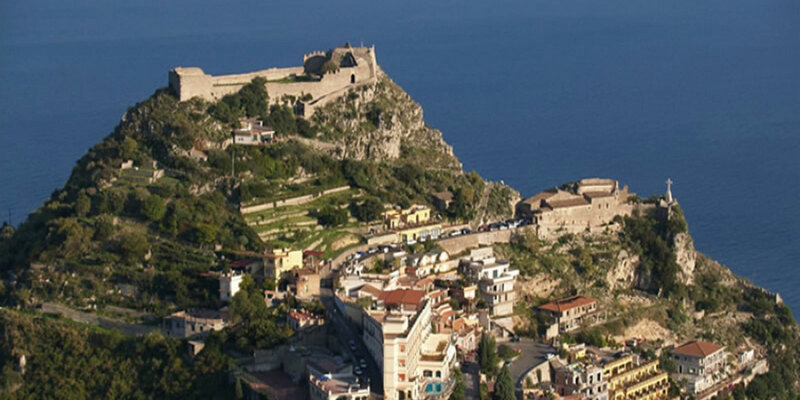 After a short break you will set off to Taormina, one of the most fascinating medieval towns of the Mediterranean. Perched on the side of a hill overlooking the sea, Taormina is delightfully characterful. The buildings in the town centre have remained unaltered since their construction, retaining all of their original picturesque features and overflowing with cascades of brightly-coloured flowers. Upon arrival you will take a walk through the town. You will set off from the Cathedral and stop to take some photos from the well-known Palazzo Corvaia (outside view), a 15th century mansion. This building, which is representative of the architecture of its time, is embellished with traditional double windows. You will then continue on and visit the majestic Greek Theatre, which was built in the 5th century b.C.. It is an extraordinary monument in a spectacular location, and its acoustics are still excellent. Before leaving the town you will have some free time to explore Corso Umberto, a pedestrian area bordered with shops and cafés. The street eventually branches off into several narrow alleyways where you will have a chance to shop for local handmade products. After the visit you will catch up with your guide and return to the hotel. 08.15 - Meet up with the guide at the hotel and board the coach. 08.30 - Departure for Mount Etna. 10.45/11.15 - Arrival at Mount Etna; visit the exhausted craters. 11.45 - Departure for Taormina. 13.00 - Arrival in Taormina. 14.30/16.00 - Visit the city and the Greek Theatre. 17.15 - Departure for Taorimina and return to Messina. 18.30 - Arrival in Messina.